Also, amid diverse challenges tearing Nigeria apart, Lagos State Governor, Mr. Akinwunmi Ambode, has urged religious leaders across the country to intensify for God’s intervention and restoration of hope in the future of Nigeria. The two leaders gave the admonition at an inter-denominational service organised by the Lagos State Government to mark Nigeria’s 58th independence anniversary at the DLBC headquarters yesterday, canvassing the need for all countrymen to stand up against corrupt practices. The service, which was conducted by the General Superintendent of Deeper Christian Life Ministry (DCLM), Pastor William Kumuyi, was attended by the wife of the governor, Mrs. Bolanle Ambode; Chairman of Christian Association of Nigeria (CAN) in Lagos State, Apostle Alexander Bamgbola, among others. At the interdenominational service, Osinbajo, who spoke, on a subject: ‘Coming of Age,’ noted that Nigeria had come of age at 58 and that there were certain offensive things, which all Nigerians must reject, one of which he said was corruption. 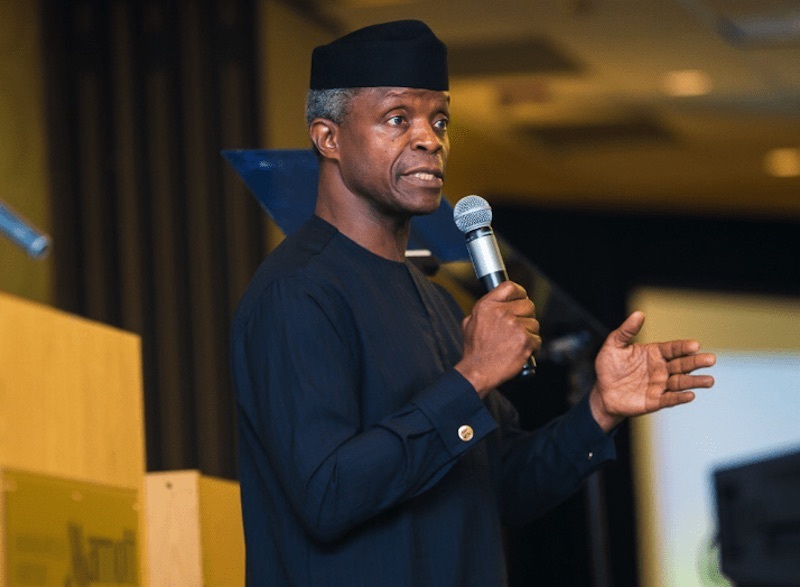 The vice president explained diverse reasons all Nigerians should shun corrupt practices and obey God in all ramifications as conditions for repositioning for global reckoning. Apart from rejecting corruption, the vice president also urged all Nigerians to reject tribalism and ethnicity if the country would move forward among the comity of nations. He equally emphasised the need for all countrymen “to turn away from their wicked ways. On this note, we should reject evil and hate what God hates. As we reject that, we will pass through the Red Sea. “My brothers and sisters in the Lord, at this auspicious period in the history of our country, the Church and indeed everyone who believes in the efficacy of prayer have a responsibility and patriotic duty to pray for the well-being and progress of our country. I believe strongly that the best of our country and our state is yet to come. Let us continue to pray, hope and work for a better future,” the governor said. Ambode, therefore, challenged all Nigerians “to eschew all tendencies that may aggravate the challenges being experienced at the moment. “Today’s occasion is also coming at a critical time in the history of our country when all hands must be on deck to sustain and deepen the process that will result in sustainable growth and good governance for our people. Ambode, also, acknowledged the contributions of the church to the state since its establishment, that that the Gbagada community had benefited immensely from their various corporate social responsibility projects initiated by the church. Ambode said the contract for the road, which was awarded in September 2017 was already 60 percent completed and is expected to be concluded by the end of the first quarter of 2019, while adding that adjoining road networks such as Diya Street and Ajayi Aina streets have been scheduled for rehabilitation to further enhance road connectivity within the axis. In a message he titled “Becoming a Man God uses Beyond his Generation,” Kumuyi said to be used of God for His higher purpose, everyone must be get the Saviour’s pardon, have strong persuasion, sound principles, strategic programmes, selfless perspectives, scriptural perception and sterling paradoxes. Kumuyi said God had a purpose for each individual, family and every community and Lagos State in particular, adding that God still used yielded men and women to execute His divine mandate in every family, institutions, among others. According to him, our service to all men must be that of sincere servanthood, grace and godliness; sustained support for the grassroots, supervised strategies with ground-breaking goals; possess self-sacrifice without guaranteed gain; strict steadfastness to the golden rule and submission to God and His will.